Welcome to AdverTimeWarp, where iconic and odd car ads are pulled straight from the 80's magazines that held them for decades and brought new life! 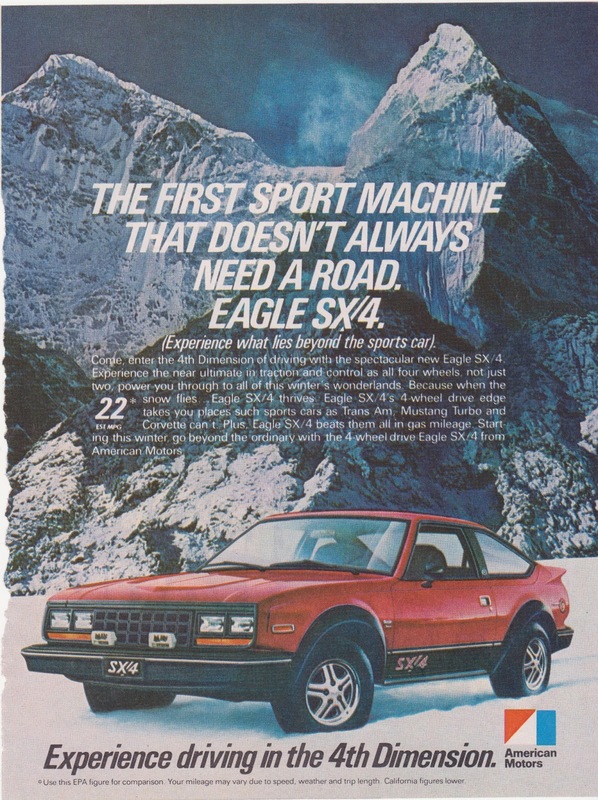 Today's 1985 AMC Eagle SX/4 was years ahead of it's time by combining real four wheel drive capability with sporty car looks. Alas it would prove to not be enough to save American Motors. The AMC Eagle was a line of 4WD cars built from 1980 to 1988 in sedan, coupe, wagon or sporty hatchback form. 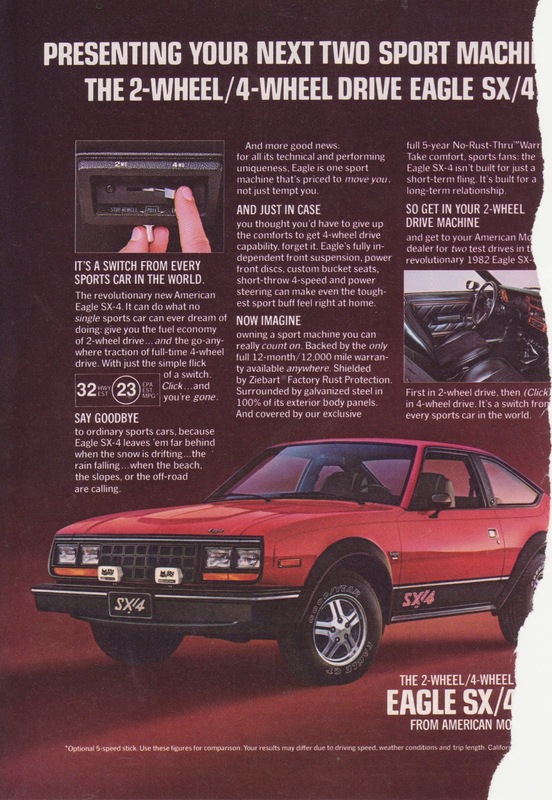 Eagle SX/4's came standard in 1985 with a stout 258 cubic inch (4.2 liter) straight six backed by a 5 speed manual. A switch activated part time 4WD system was also standard and a large improvement from the full time 4WD system on earlier models. Make sure to click the images to expand and then right click "open image in new tab"; they're huge! While one could argue that Subaru was also making 4WD cars at this time, they certainly didn't have the Eagle SX/4's panache. 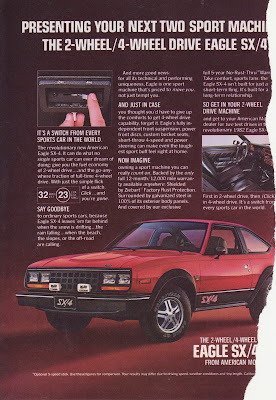 With fender flares, blacked out trim, rear spoiler and a sporty interior, the SX/4 was more like a four wheel drive Trans Am. Finding a modern equivalent would be very tricky. There are many crossovers and many capable SUV's but very few combine both traits like the SX/4 did. Perhaps the equivalent would be a Jeep Grand Cherokee with a Scion FR-S body on top. In fact, someone should build that.